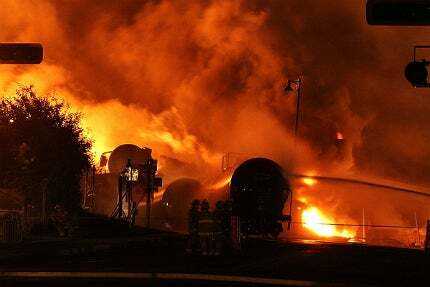 The tragic derailment at Lac-Mégantic has renewed calls for improved safety standards on Canada's extensive railways. What technologies are needed to help prevent a repeat of that deadly crash, and do regulators and industry have the will to implement these costly upgrades? Firefighters battle the blaze after the derailment and explosion at Lac-Megantic, Quebec. Photo courtesy of the Transportation Safety Board of Canada. An aerial shot of the devastation in Lac-Megantic's downtown area. Photo courtesy of Sûreté du Québec. The TSB is calling for extra protection systems to ensure compliance with signals. Photo courtesy of the Transportation Safety Board of Canada. A TSB investigator surveys the damage at the site of the Burlington train derailment. Photo courtesy of the Transportation Safety Board of Canada. As investigators continue to sift through the rubble at Lac-Mégantic, the Quebec town that recently suffered Canada’s deadliest rail disaster since 1864, the Canadian railway industry and safety authorities are asking tough questions of themselves and their policies. Death and destruction on the scale of Lac-Mégantic, where on 6 July a runaway freight train carrying crude oil derailed and exploded, killing 47 people and tearing down nearly half of the downtown area, is both an unmitigated tragedy and a potent reminder of how dangerous rail transport can be if the worst happens. The Transportation Safety Board of Canada (TSB) is now wrapping up the on-site phase of the investigation into the Lac-Mégantic disaster, but as the TSB’s director of rail and pipeline investigations Kirby Jang acknowledges, a long road remains before the exact causes of the derailment and explosion can be confirmed. "We’ve assigned quite a few of our resources, both within the rail branch and other supporting branches including our operational services area," Jang says. "We’re moving on to our second phase, which is an examination and analysis phase, and it’s going to be lengthy process. Obviously it’s a very complex investigation, but we’re devoting our time and effort to making sure we cover all aspects." "It’s a very complex investigation, but we’re devoting our time and effort to making sure we cover all aspects." Though the TSB’s investigation is far from complete, the derailment has already prompted action from the country’s rail regulator Transport Canada. In the weeks following the tragedy, which occurred after 73 cars from the reportedly unattended train became uncoupled and rolled down a hill into the town, the agency issued an emergency directive. Among other requirements, the directive stipulated that no locomotive carrying dangerous goods can be left unattended on a main track, and that these locomotives must be operated by at least two qualified personnel. The lesson was quickly picked up by Canada’s southern neighbour, as the US Federal Railroad Administration put into place similar rules soon after. As Canada continues to drive economic growth through production and transportation of petroleum products by rail – 140,000 carloads of crude oil are now shuttled around the country’s freight rail network, compared to just 500 in 2009 – the government, Transport Canada and major industry players will need to look closely at safety measures to make sure this growth can be sustained without risking the lives of the greater public. While the initial response to Lac-Mégantic was rapid, as is usually the case after a disaster on that scale, Canada’s wider network has safety issues that have been long unaddressed. These lingering issues were the reason for the TSB’s 2010 release of a ‘watchlist’ of key safety issues that urgently needed to be tackled. "[The watchlist] was for internal purposes," says Jang, "but back in 2010 we wanted to highlight these issues to the general public, to the stakeholders, to ensure there’s ongoing awareness of these issues and hopefully discussion among the key stakeholders, which would lead to improvements and advancements in these areas." "TSB’s safety recommendations are not mandatory for the industry." Since 2010, Jang says that three of the four items on the list – the operation of longer, heavier trains; safety management systems; the need for tougher data recorders – have been addressed comprehensively enough to be removed from the list. The spring 2012 update of the watchlist retained one item from the 2010 version and added two further issues on which it would like to see concerted action in the coming years. The leftover from 2010’s list is the risk of collisions between trains and road vehicles at level crossings, as persistent a problem in Canada as it is on many other rail systems around the world. "There have been some improvements over the past two years, but to our mind, safety action has not been sufficient to remove it from the watch list," says Jang. The issue was highlighted in April this year by Canada’s then-Minister of State for Transport, Steven Fletcher, as he launched Rail Safety Week and a new round of funding to make safety improvements at level crossings around the country. "This $9.3m investment of new funding will enhance safety for pedestrians and motorists at 523 locations across the country, and help to save lives," said Harper at the launch. The government quoted studies that found accident rates at level crossings drop by 69% and deaths are reduced by up to 80% after improvements, such as traffic signal integration and gate barriers, are introduced. The first new addition to the TSB’s watchlist – following signal indications – is linked to its findings after two major train derailments in the last few years, at Saint-Charles-de-Bellechase, Quebec, in 2010 and at Burlington, Ontario, in 2012. While the former caused only injuries and property damage, and the latter caused the deaths of three engineers, they have an important causal factor in common – both trains were travelling at excessive speeds while switching tracks, having missed or misinterpreted signals. "In Canada we have a system called Centralised Traffic Control, which provides visual signals but there is no automated stopping or slowing of trains if the train crew were to exceed the limits of their authority," explains Jang. "We believe that there’s a risk of serious train collisions and derailments if rail signals are not consistently recognised and followed. Really, what we’re trying to advocate is that further safety defences should be implemented to ensure that signal indications of operating speed or operating limits are consistently recognised and followed. That’s a key finding and recommendation out of Burlington." Jang says there are ongoing discussions about signal automation or positive train control (PTC) systems, which automatically reduce a train’s speed if it is moving faster than signals indicate it should. The TSB is still waiting for Transport Canada’s response to its June 2013 report on the Burlington crash, with the implementation of automated signalling fail-safes one of its key recommendations. With PTC due to become mandatory in the US in December 2015 (although that deadline could well be missed due to the system’s cost and complexity) and Europe moving forward with the interoperable European Train Control System (ETCS), Canada will have to act fast to get the ball rolling on a protection system of its own. "There’s a risk of train collisions and derailments if rail signals are not consistently followed." The last item on the watchlist is also linked to TSB rail crash investigations, or more specifically the limitations of those investigations. For ten years, the safety board has been pushing for video and voice recording devices to be placed in the driver’s cab on locomotives, similar to the flight recorders installed on aircraft, as a potentially invaluable source of data in the event of a crash and subsequent investigation. Jang notes that investigations into the derailments at both Saint Charles and Burlington could have been considerably more conclusive if this data had been available, especially as the reasons behind the missed signals in those incidents are still completely unknown. "Both occurrences at Saint Charles and Burlington, the factors leading up to the events, for example the nature of the communications between the crew members, crew performance and so on – these are items that we could have reviewed and analysed if there had been either voice or video recorders," he says. "In this case there were not; we did a very comprehensive review of all other available information. There were a number of theories in terms of what actually did happen. At the end of the day, in our findings of contributing factors we had to indicate that something may have occurred or likely had occurred. It wasn’t definitive in terms of the exact causes." The advantages of installing these devices must be balanced against the potential privacy concerns of drivers and locomotive engineers, as expressed recently by the Teamsters Canada Rail Conference, which fears it will be used for compliance monitoring and disciplinary matters. And, as with positive train control, the cost of equipping recording systems across all trains is a point of contention for locomotive owners and railway operators. But TSB’s safety recommendations are not mandatory for the industry; they are simply passed on to Transport Canada, which works with stakeholders to decide if and when safety measures should be implemented. In this respect, some have argued that Canada’s regulatory regime allows the industry too much leeway on railway safety. Under the country’s safety management systems, rail companies are effectively able to set their own safety standards, as long as they submit to Transport Canada’s audits and inspections. And with critics claiming the regulator’s rail safety inspection force is severely understaffed, it’s possible that companies aren’t under enough pressure to maintain safety protocols. After all, with that much breathing space, is it any surprise that the industry is dragging its heels on safety measures that would cost companies tens of millions and possibly disrupt profitable operations? Whether or not making TSB safety recommendations mandatory or Transport Canada taking a tougher regulatory stance would be a viable approach to speeding up safety improvements is unclear. In between disasters such as Lac-Mégantic, Transport Canada can point to a consistently improving rail safety record since 2005. But as the TSB’s watchlist attests, there are still life-saving improvements to be made, and it will take money and effort to make them. Hydrogen-powered rail: is it time to convert? The rail industry looks set to invest heavily in natural gas as a next-generation locomotive fuel, but is that short-sighted?